Small shop on the ground floor of Gary Court, on London Road. 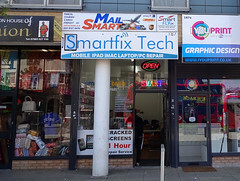 It sells mobile phone accessories and also offers phone and computer repairs. It was previously known as Option Mobiles photo, but became Smartfix Tech some time between March 2017 and June 2018. Last edited 2018-07-20 09:15:05 (version 28; diff). List all versions. Page last edited 2018-07-20 09:15:05 (version 28).